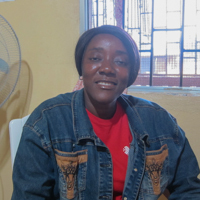 Delkontee is both a nurse and a midwife. She has practiced in various settings, including working for the international health NGO Merlin. She currently works in an emergency department of E.L.W.A. Hospital which she focuses on assessing pregnant women. Delkontee’s initiative focuses on family planning in the King Gray and Kpelle Town Community in Monrovia. Her initiative has a two-pronged approach: community-based family planning education as well as home-based health services. Home based health services include health monitoring as well as providing family planning education and medication as requested by participants.